With the return to ladylike styles for women, it only makes sense that the trend would make its way to menswear. I don’t know about you but nothing screams polished, like a nice suit. Enter the WWD article from March 11th 2010 that highlights the popularity of customs suits in the mass market. With prices ranging from $300-$900, this new crop of custom suit retailers have been going head to head with department stores and their off the rack suits. My.Suit seems to be doing everything right in this market, sadly the closest store is on Madison Ave. in NYC. Have no fear though, Astor & Black and Indochino are available. 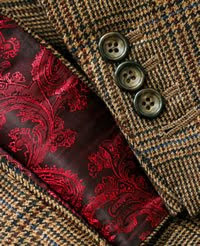 Both sites offer custom suits for under $500 that can be delivered in a matter of weeks. What are you waiting for guys?? Hopefully one day soon we’ll all look like cast members from Mad Men. Top 10 Fall/Winter 2010-11 Colors…why you ask??? What did I tell you about the denim trend?? Aire! Thank you for mentioning Astor and Black! They are the official clothiers of NHL as well as Bentley Motors of North America. They dress many of professional athletes especially due to their hard fits. Much Love you Athletichic!